As we greeted the new year several weeks ago, many of us either made resolutions or chose a word to keep us on track throughout the year. I shared that my word was dedication, and one area I’m dedicated to is hiding God’s word in my heart. I believe as Jesus followers that we must know who our God is, and we must desire to know Him even deeper. How do we do that? We must be in His Word and in constant prayer. Consequently, when I discovered this simple, easy hack to memorizing scripture, I had to share it with you! I confessed a few weeks back that I’m not good at scripture memory. Never have been. Truthfully, I’m not good at memorization–period. It’s just not one of my strengths. Thus, I asked other Christian bloggers if they had tips or hacks they wouldn’t mind sharing, and I did a roundup post sharing all of their neat tips and tricks. Some of them I’ve tried; some have worked, some not as much. Honestly, I’m the reason some haven’t worked. I think truly it boils down to our learning styles and our determination to actually commit scripture to memory. If you are anything at all like me, you like quick results without much effort. That’s tough to admit. It’s not that we don’t want to have scripture ready to share anytime, anywhere, it’s that we (or maybe it’s just me) aren’t dedicated or determined enough to make it a priority. Nonetheless, I meant what I said about being dedicated to learning scripture, but I had to figure out what worked for me. Admittedly, that took a little trial and error. 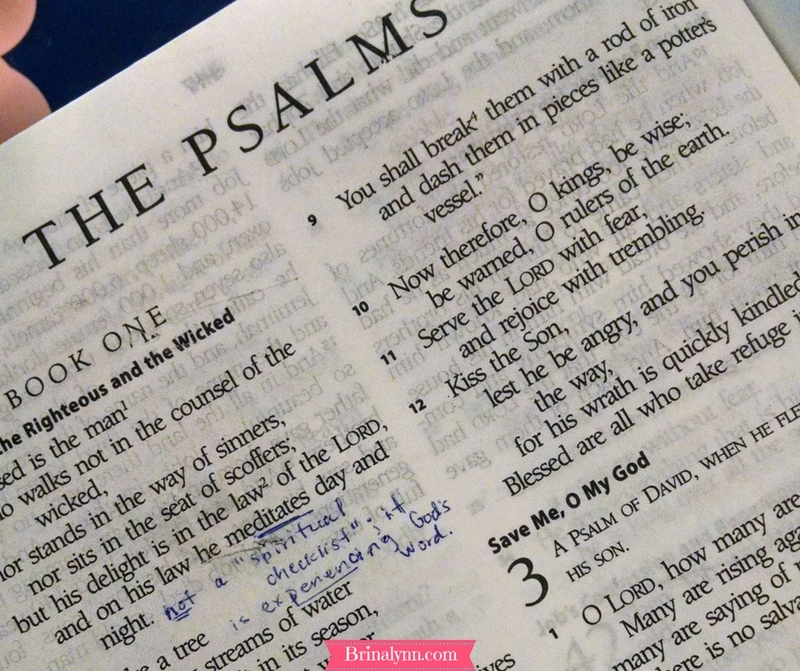 As the new year began, I was determined to memorize Psalm 34, and I did. Today, however, without being prompted, I can’t even remember how the Psalm starts out. Sad, right? I got so discouraged. I had worked so hard to commit that passage to memory, and it had taken weeks. Ugh–I was so disappointed in myself. 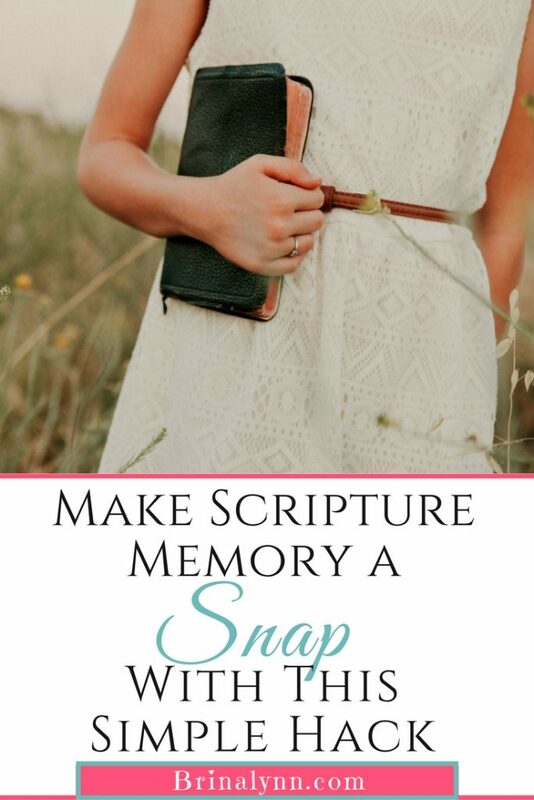 Make Scripture Memory a Snap! Then it happened that I was doing a Bible study with the ladies of my church. 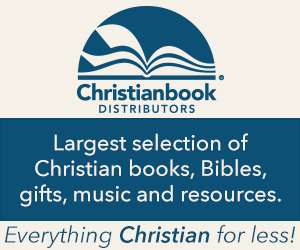 The study was Priscilla Shirer’s Discerning the Voice of God, so of course, she was teaching how we know we are hearing the voice of God, and one way is through His Word. One week about halfway through the study, she talked specifically about committing scripture to memory, and she gave a short list of places to start. She said to get cards, choose a scripture to memorize, and write it on on several cards, placing them throughout your daily path. Well, I’m kind of lazy and finding index cards and tape weren’t appealing to me, so I opted for sticky notes. 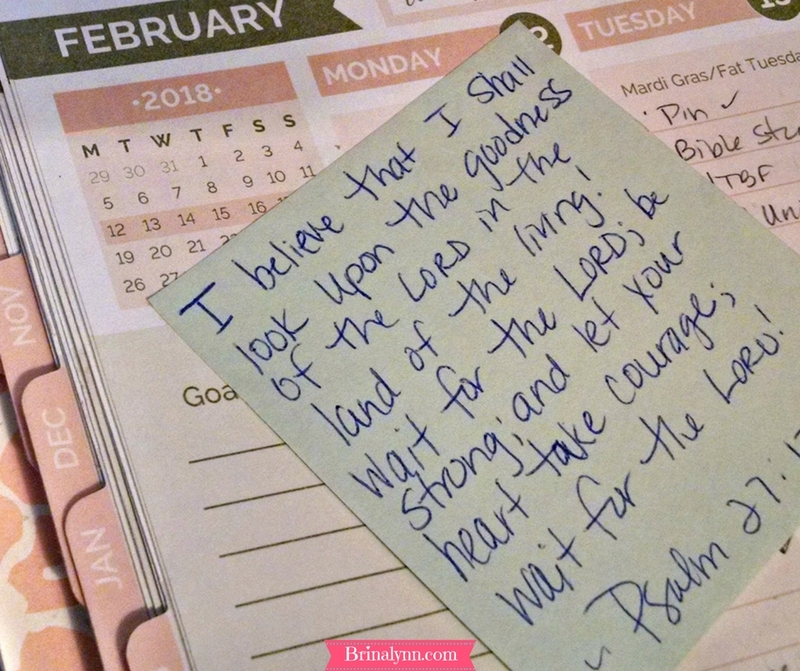 I wrote my scripture passage, Psalm 27:13-14, and stuck it in five places I knew I’d encounter several times a day: the bathroom mirror, my Bible study book, my Bloom daily planner, the kitchen window, and the microwave over the stove. Each time I stood at those places or sat ready to study or work, I made myself read the scriptures. Every single time. Within days, I had memorized those first two. This trick will seriously make scripture memory a snap! Not only had I memorized them, but I knew them in my heart and they spoke to me at exactly the point in life I am, facing some unknowns, seeking earnestly the will of my Father. Ya’ll, this should probably be called “the lazy mom’s (or maybe the busy mom’s) guide to scripture memorization,” but it works for me. I cannot memorize and retain quickly and randomly. It has to apply and speak to my heart. I learned, too, that I can’t do large passages at a time. Perhaps some day I will get there, but for now, I’m excited that I have found what works for me. I pray that my lazy mom’s hack helps you, too! It’s not fancy or brilliant. Rather it’s simple and easy, exactly what I need during this busy time of life. And in case you forgot or didn’t see it before, check out AJ’s 50 Important Scriptures to Memorize! Give it a try! Will you join me? Comment to let me know if you will try it for a week and what verse(s) you choose to memorize. Love this! I will try it. Thanks for sharing it. I loved this post! I struggle with remembering scripture as well so I’m so excited to try this method out. I also love the thought of having God’s word on sticky notes around the house just to serve as a reminder of how amazing He is! thank you for sharing sis! I’m much like you in memorizing, I really struggle. What has helped me is my job. I have to change my computer password frequently. Caps, lower case, numbers, special character. Jeremiah19!11. Luke23!43. Proverbs22:6 Options are endless, and for 6 weeks or so I say that verse every time I log on. Oh, Vikki, what a great idea! !